Frist quarter for 1. All local band. First Let's Ring! Quarter Peal. 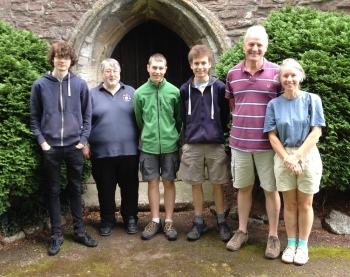 L-R: Ed Miller, John Cornock, Alistair White-Horne, Ben White-Horne, Tony Bulteel, Catherine White-Horne. First submitted Sunday, 30 July 2017 at 12:00:10 by Alistair White-Horne. Sent for publication in The Ringing World on Sunday, 30 July 2017 at 12:00:37.